The rider’s aids are both his natural and artificial means of communicating with the horse. The “natural aids” are the rider’s legs, hands, weight, and on rare occasion, voice. A subtle “whoa” is acceptable; but yelling “Come on, Sparky, jump this fence!” is not. Carolyn Curcio demonstrates the proper position at the walk. Notice that her knee and toe are on the same vertical line; her heel is pressed down; her calf is in contact with the horse's flesh just behind the girth; her seat is close to the front of the saddle; and her knee is closed against the kneeroll. Her upper body is only a few degrees in front of the vertical---just enough to be with the motion of the horse. There is a direct line between her elbow and the horse's mouth; and her eyes are up, looking between the horse's ears. Furthermore, the horse is beautifully collected into a medium frame and seems to have a calm demeanor, which is the mark of good riding. The only thing I would correct is that her hands are a little flat. They should be turned in at a 30-degree angle from the vertical, whereas they are at about a 50-degree angle in this photo, an error sometimes referred to as "puppy hands." The diagram below shows a left indirect rein (left), a direct rein (center), and a right indirect rein (right). For a left indirect rein, the rider’s left hand moves back and right hand moves forward, allowing the horse to turn its head to the left. 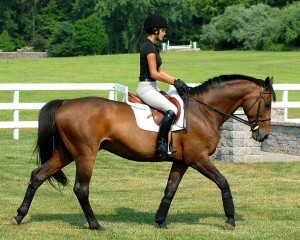 For a direct rein, both hands are evenly placed and keep the horse’s head and neck straight. In a right indirect rein, the right hand moves back and the left hand moves forward, again allowing the horse to turn its head. If the hand to the outside of the bend does not move forward, the rider creates “clashing aids,” which is asking the horse to do something while preventing the animal from doing it. Nothing makes a horse more frustrated than when a rider clashes his aids. An indirect rein position varies according to the degree of the bend. 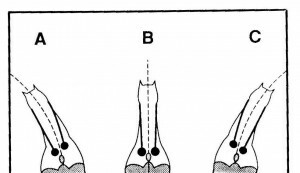 For example, when making a small circle, the horse would be bent more acutely, so the inside hand would be back more and the outside hand would have to move forward more to enable the horse to have a greater bend in its neck than if the horse were on a larger circle. The indirect rein can also be used very subtly. If a horse is spooking away from something on the outside of the arena, the rider can use a slight inside indirect rein, bending the horse toward the inside of the arena just a little, prohibiting the animal’s eyes from locking onto the spooky object. In this case, the bend would not be nearly so much as pictured above. You must be physically fit in order to remain glued to your horse at all times. Fitness can prevent such accidents as being slung into the fence if your horse stops, or sliding off if it spooks to one side. Ideally, you would like to be so fit and well-coordinated that the only way you would hit the ground is if your horse fell, too. Work done in two-point position strengthens the front and inner part of your thighs, so that you’ll soon become fit enough to hold yourself out of the saddle over a fence, rather than weakly dropping your seat onto the horse’s back. Two-point work also strengthens your lower leg, making your calves steadier against the horse’s sides and creating more weight in your heels. To perform this exercise, first shorten the stirrups to your jumping length. Then pick up the trot and work around the ring in two-point position, with your heels pressed downward, your calves snugly held on the horse’s sides, and your knees and thighs supporting the weight of your upper body. You can grab a bit of mane in one hand to stabilize your upper body, but don’t lean on your hands. It is essential for beginning riders to practice two-point position daily, since this will provide the security they need to jump safely. It is also a good exercise for an intermdiate or advanced rider, particularly one who has just one horse a day to ride. Two-point position will help upper-level riders achieve and retain the degree of fitness they need to ride over complicated courses. The second strengthening exercise is sitting the trot without stirrups. It helps you learn to sit comfortably and securely and to remain near the horse’s center of gravity. To prepare, drop your stirrups, pull the buckle on each stirrup down about six or eight inches, then cross the stirrup leathers over the horse’s withers. If you turn the top strap of the leather upside down before you cross it, your inner thigh won’t be resting on a lump that could bruise you. Your crotch should stay as close to the pommel as possible during this exercise, so that you are forked into the saddle with a secure thigh and knee position. (If you begin to slip backwards, grasp the pommel with one hand and adjust your position by pulling yourself forward.) Your calves should rest snugly against the animal’s sides, and the toes of your boots should be tipped upward, as though you were still riding with your stirrups. When working without stirrups at the sitting trot, then, your leg position should be exactly sthe same as it was when you had stirrups. The third exercise, which is more strenuous than sitting the trot without stirrups, is posting without them. This strengthens your thighs and calves, stabilizes your knee position, and helps your upper body find its center of gravity over your legs. Your leg position at the posting trot without stirrups should be the same as with stirrups, except that you can carry your knees slightly higher to make up for the lack of support from your irons. Between every three- to five-minute session of work without stirrups, you can take a break, walking the horse on a long rein and, with your feet out of your stirrups, hanging your legs loosely along the horse’s sides to stretch and relax the muscles so that they will not cramp. It is virtually impossible for most riders to keep posting without stirrrups for even three minutes when they first begin this exercise. In fact, many cannot make more than one circuit of the arena before they feel exhausted. This exercise is very taxing; it is best practiced correctly for short intervals, rather than incorrectly for extended periods of time. At this point, a fourth set of exercises should be mentioned. Although they do not increase your strength, they help you learn how to stay on the horse through balance rather than through gripping. These exercises entail your being longed without stirrups or reins by an instructor, so that you can concentrate on your body rather than on controlling the horse. To prepare, set the horse up as usual for longeing (see http://annamullin.com/BookChapters/longeing ), except for the stirrups and reins. Remove the stirrups entirely and knot the reins around a clump of mane or around the part of a martingale that rests just in front of the withers. When being longed, try to feel your center of gravity at the various gaits and keep it as closely aligned to the horse’s center of gravity as possible. If you slip backward in the saddle, grab the pommel with your outside hand and the cantle with your inside hand and adjust your seat to the front of the saddle. By remaining close to the pommel and keeping your weight equally distributed on each side of the animal’s body, you will be able to sit comfortably at every gait. Your leg should remain in a normal riding position while you perform various suppling exercises with your upper body. The exercises required by your instructor should be designed to reduce tension in your body, help you develop better balance, and raise yor level of confidence.